Richard Exell goes into great depth on today's unemployment figures, and explains quite why they are so bad for the coalition. Today’s labour market statistics (pdf) brought another slew of bad news and clear evidence that the government’s employment strategy isn’t working. In the three months from August to October there were 29.11 million people in employment and the employment rate for working age people was 70.3 per cent. These figures were down by 63,000 and 0.2 points from May-July. 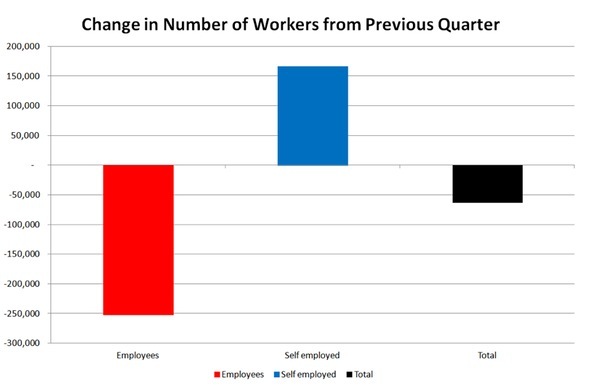 This overall figure disguises the huge shift to self-employment that has taken place: since May-July, the number of people who are self-employed has risen by 166,000 but the number of employees has fallen by 252,000. If this was the result of an explosion of entrepreneurial spirit, it might be no bad thing. But in bad times you often see a growth of self-employment – workers desperate to work again employing themselves because no one else will. Small businesses have very high failure rates and times like this are just about the worst time to be starting up. Worse still, workers who have had a redundancy payment often invest it in their new business and end up losing their savings before returning to unemployment. Unemployment, measured using the International Labour Organisation standard, was 2.64 million, the highest level since Jul-Sept 1994. The unemployment level was 128,000 higher than in the previous quarter. This is the third month running the increase has been over 100,000, the last time this happened was in the summer of 2009. The unemployment rate was 8.3 per cent, the last time it was higher was in Nov-Jan 1996. This rate was up 0.4 points on the quarter, again the third month in a row this has been the case and the last time this happened was the summer of 2009. The number of unemployed young people reached another record, 1.027 million, up 54,000 on the quarter. (But the current series of statistics only began in 1992 and the Office for National Statistics believe that youth unemployment was higher in the 1980s, passing 1.2 million in 1984.) The youth unemployment rate was 22.0 per cent, also a record. The number of unemployed women passed the 1.1 million mark for the first time ever, reaching 1,103,000. There have now been more than one million unemployed women for 16 consecutive months. The number of vacancies fell 8,000 to 455,000 and the number of vacancies per 100 employee jobs fell slightly to 1.7 – both are post-recession records, the lowest figures since Sep-Nov 2009. The number of unemployed people per job vacancy was unchanged from last month, at 5.7. My colleague Anjum Klair’s monthly round-up of the local unemployment blackspots finds ten where the unemployed : vacancy ratio is over 16 and five where it is over 20. The Claimant Count (the number on Jobseeker’s Allowance) is a more up-to-date statistic (but much lower, because the tough JSA rules exclude so many genuinely unemployed people). In November, the CC rate was 5.0 per cent, the highest since August 1997. There were 1,598,600 people claiming JSA, up 3,000 from October, and up 138,000 from November 2010. The policy world may be under-estimating the likely rise in unemployment next year. The latest Treasury round-up of City economists found that the average new forecast for the Claimant Count in the last quarter of 2012 is 1.74 million and the OBR forecast in the Autumn Statement is 1.75 million. This would mean an increase in the next twelve months no greater than that in the last 12 months – which looks optimistic at present. 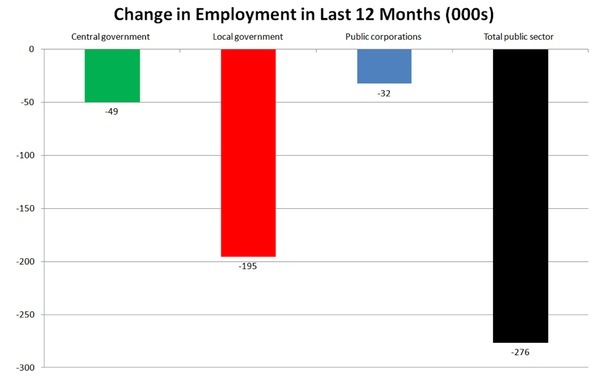 Whatever you say about the chancellor’s economic ambitions, the employment strategy has always been quite clear: public sector employment is going to fall, but the private sector will more than compensate. That is the basis for the expectation that there will be a net rise in employment of one million by 2016/17, despite a reduction of public sector employment by more than 700,000 and the Prime Minister defended this approach at Question Time. 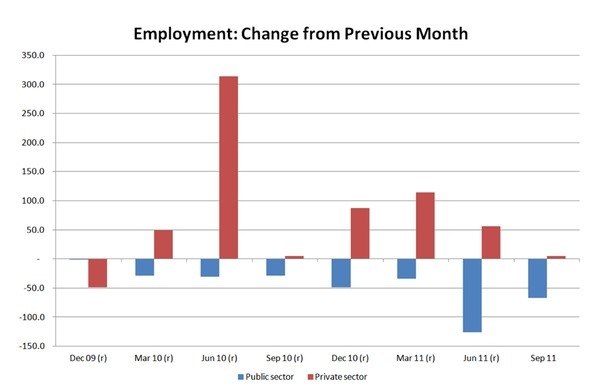 • In the last quarter, public sector employment fell 67,000 while private sector rose just 5,000. To sum up, there has been another set of record bad figures, which would have looked even worse if it had not been for an increase in self-employment which isn’t necessarily a good thing. The government’s forecasts for unemployment assume that the next 12 months will be no worse than the last 12 months. And if the strategy of relying on private sector job growth to compensate for public sector redundancies is going to work, let’s hope it starts working soon. increase in self-employment which isn’t necessarily a good thing. Wrong sort of leaves? Wrong sort of snow? You mean somebody in the political class (from any party) actually has a plan? You missed the unfortunate boom in people working for their dad for nothing…. @faisalislam: Ahhh. A 27% boom in one category of “employment”. Todays quarterly inc in workers include a 24k increase in “unpaid family workers”.